Approximately 5 billion people do not have access to safe, timely, and affordable surgical and anesthesia care, with this number disproportionately affecting those from low–middle-income countries (LMICs). 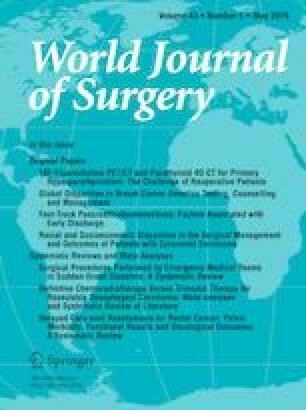 Perioperative mortality rates (POMRs) have been identified by the World Health Organization as a potential health metric to monitor quality of surgical care provided. The purpose of this systematic review was to evaluate published reports of POMR and suggest recommendations for its appropriate use as a health metric. The protocol was registered a priori with PROSPERO. A peer-reviewed search strategy was developed adhering with the PRISMA guidelines. Relevant articles were identified through Medline, Embase, CENTRAL, CDSR, LILACS, PubMed, BIOSIS, Global Health, Africa-Wide Information, Scopus, and Web of Science databases. Two independent reviewers performed a primary screening analysis based on titles and abstracts, followed by a full-text screen. Studies describing POMRs of adult emergency abdominal surgeries in LMICs were included. A total of 7787 articles were screened of which 7466 were excluded based on title and abstract. Three hundred and twenty-one articles entered full-text screen of which 70 articles met the inclusion criteria. Variables including timing of POMR reporting, intraoperative mortality, length of hospital stay, complication rates, and disease severity score were collected. Complication rates were reported in 83% of studies and postoperative stay in 46% of studies. 40% of papers did not report the specific timing of POMR collection. 7% of papers reported on intraoperative death. Additionally, 46% of papers used a POMR timing specific to the duration of their study. Vital signs were discussed in 24% of articles, with disease severity score only mentioned in 20% of studies. POMR is an important health metric for quantifications of quality of care of surgical systems. Further validation and standardization are necessary to effectively use this health metric. Marie-Rachelle Felizaire, Tiffany Paradis these authors contributed equally to this work. All authors disclose no conflicts of interest.